Get the full Windows Explorer style folder tree view and view detailed information by simply clicking on the desired folder. 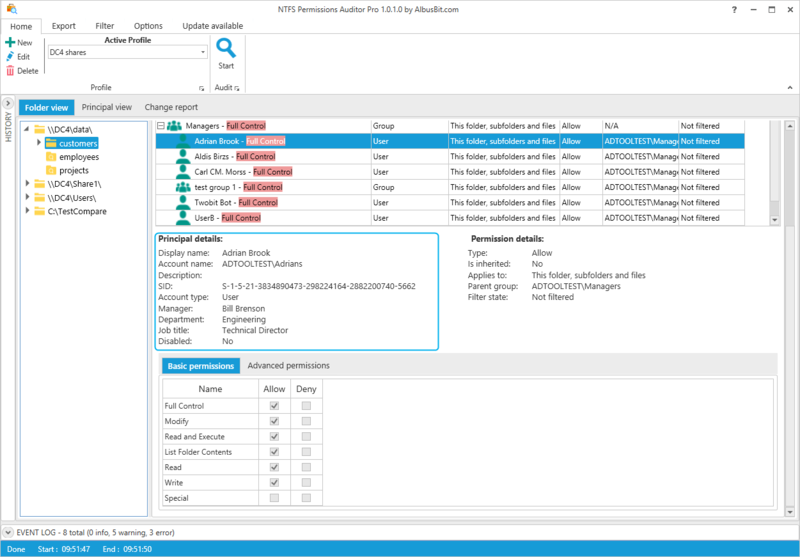 The detailed information provided includes full path, owner, last modified, permissions, inherited flag and a full list of permissions. This is ideal if you want to check a specific folder to see who can access it and their exact permissions. 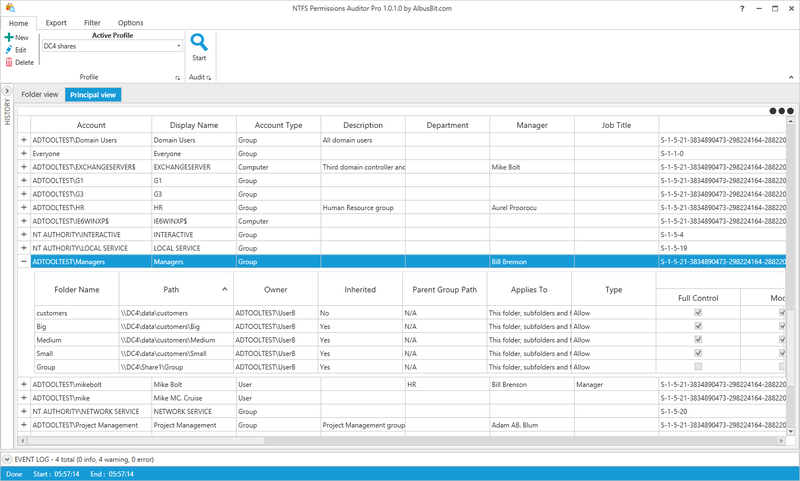 This table enables you to expand its rows and see which folders each account can access and which permissions they have - a great help if you want to check what specific users or groups can access. 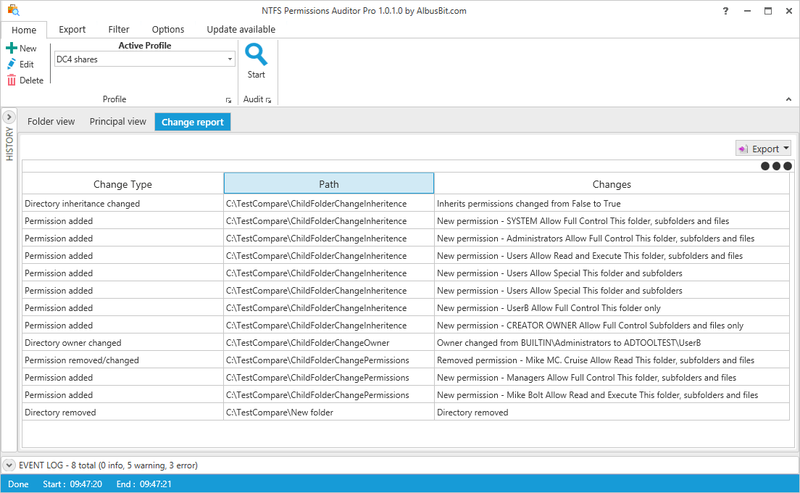 Track all folder permission changes since the last report with this feature. You can compare two audit results and see what has changed while the change reports will show which directories, directory permissions and group members have been removed, added and modified. See the main information about the account - display name, security identifier (SID), description together with additional data such as department, manager, job title, etc. In addition, for group accounts you can get information about direct and nested group members. 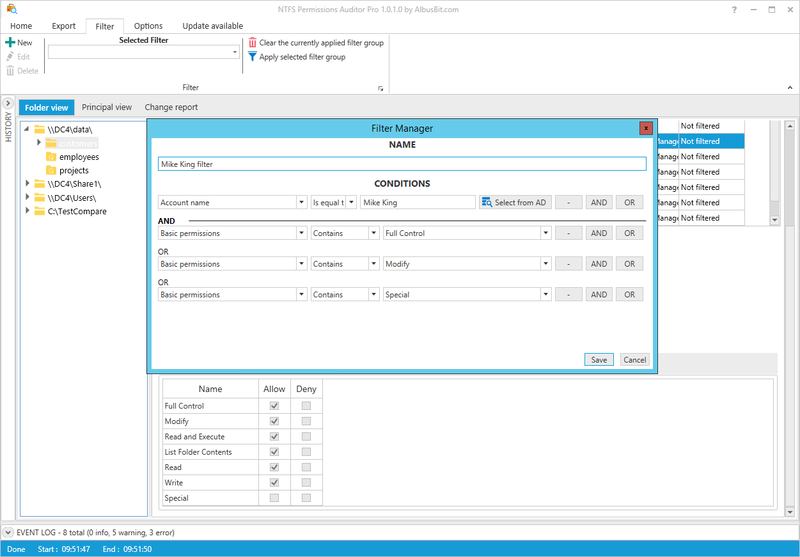 Create simple and advanced filters with the built-in filter manager. You can use the filters in the audit process or apply them after the audit is complete. 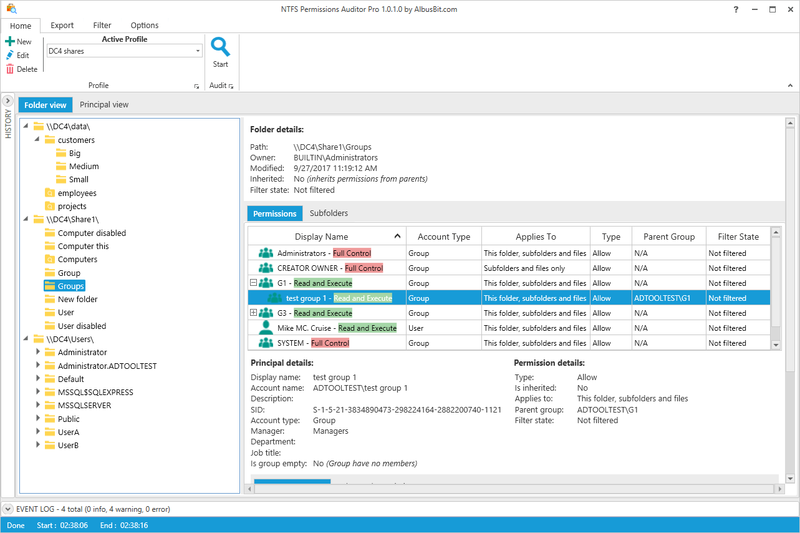 The sample filter shown in this figure will only find folders with permissions to "Mike King" and only if the permissions are "Full Control", "Modify" or "Special". 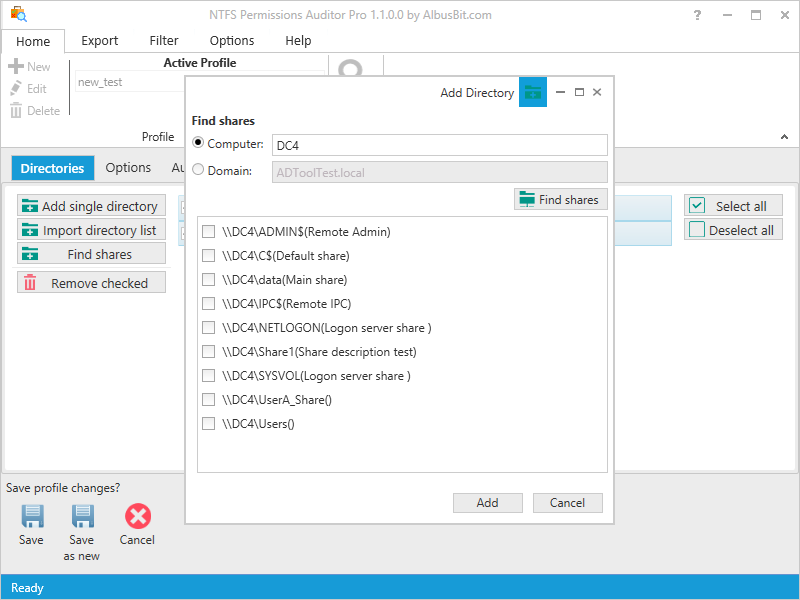 For example, if the folder has permissions to the group "Managers" and "Mike King" is a member of this group, then NTFS Permissions Auditor will find and include it in the audit results. Exclude unnecessary directories by specifying the exact path or just the directory name, and also exclude system directories and reparse points from your audit results. You can also specify the directory depth limit, and exclude disabled accounts and other specific accounts from audit results. You can export audit results to various file formats including Excel (XLSX), CSV, XML, HTML and PDF. Exports can be carried out in two ways - folder view export (broken down by folders) and account view export (broken down by accounts). Locate shares on any Windows files server or import a shares list from a text file. 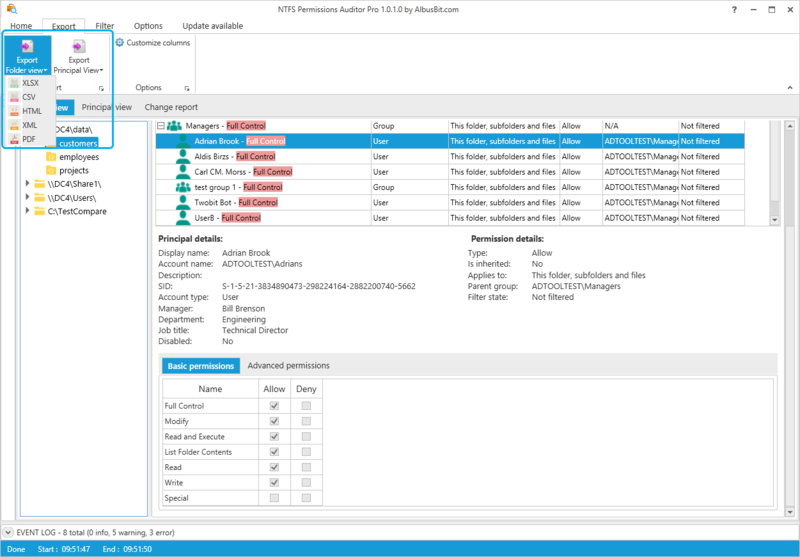 Just enter the appropriate server name and NTFS Permissions Auditor will locate all its shares. 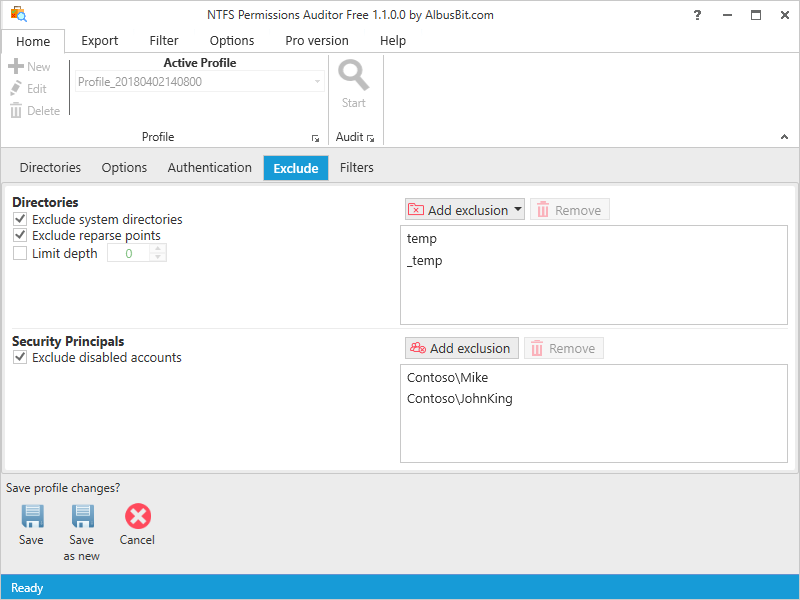 Another option is to enter the domain name and NTFS Permissions Auditor will identify all the domain computers and available shares.